1975. 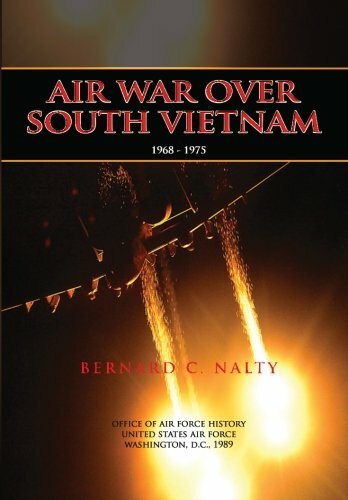 It deals with the role of the Air Force in advising the South Vietnamese Air force and waging war in South Vietnam, Cambodia, and Lao. Until the Test offensive of 1968, the United States hoped to compel North Vietnam, through military operations and negotiation, to call off its war against South Vietnam thus ensuring the survival of an independent South Vietnam. However, the 1973 peace agreement accepted the presence of North Vietnamese forces on territory seized from South Vietnam, and the survival of the Saigon regime depended upon the forbearance of the communist leadership of the willingness of the United States to vigorously response to a new attack. This history includes the so-called Vietnamization of the war, the withdrawal of American force, American and South Vietnamese operations in Cambodia, the South Vietnamese attack in Laos toward Tchepone, the containment of the invading North Vietnamese forces in 1972, the provision of additional aid from the United States, the military impact of the peace settlement, and the successful communist offensive of 1975. Air Force History and Museums Program. United States Air Force.